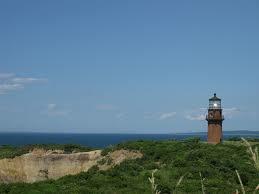 Aquinnah is the scenic and wilder end of Martha’s Vineyard. The place to run here is along Moshup Trail, which is the road that runs 3.6 miles one-way from the intersection with State Rd. to the tip, at Gay Head Lighthouse. 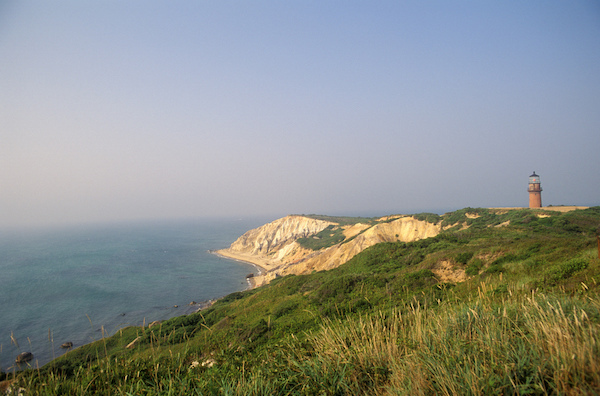 Moshup Trail sits above Aquinnah Cliffs, with great water views below. At the tip, enjoy the Gay Head Lighthouse, the Aquinnah Cliffs overlook and the Cultural Center, featuring a wonderful little museum about the history of the Wampanoag tribe. There are also several eating spots and places to sit and relax at the tip. There’s also a coastal trail paralleling the road, between the tip and Moshup Beach. For a long run, we’ve mapped a 10-mile “Tour of Aquinnah”. This starts at W. Basin Road on Menemsha Basin, along Lobsterville Rd. and then Lighthouse Rd. to the tip. Then, take spectacular Moshup Trail for 3.5 miles, cutting back to the start for nearly 2 miles along E. Pasture Rd. Note E. Pasture Rd. is unpaved and can be sandy. Note: A ‘bike ferry’ (open to anyone) runs in summer between Menemsha and W. Basin Rd., from 8am-6pm, continuously throughout the day. It takes about 5 min. and costs $5. Moshup Trail starts at the intersection w/State Rd. Car is helpful. A VTA bus does go to Aquinnnah.